On Christmas I stayed in bed all day, just completely exhausted. Yesterday I felt a little bit better but I stayed in bed all day anyway, just listing to podcasts and audiobooks and music with my eyes closed, mostly, and playing on my iPad a bit. I’m tired of the cycle of feeling a bit better, getting up to do stuff, then having a bad relapse. I’m just going to stay in bed till I’m SURE that I’m a lot better. I think that my throat finally feels completely normal this morning! So that was a 25-day sore throat. A world record? Still coughing of course. But I slept straight through the night. DJ Riko’s Christmas Mixes. We love these SO MUCH. Some of my favs are 2002, 2003, 2005, 2007, 2008, 2009, and 2014 but they’re all good! Plus random episodes of This American Life and of course The Archers every day. I felt well enough to go to the doctor today. How stupid does that sound? But it’s true, I was too sick to go to the doctor until a few days ago. This is the 16th day of sore throat and cough, which is a little better every day but still very bothersome. She says it’s maybe the flu, or maybe not, but whatever it is hit me really hard because of all my other underlying health problems. She says to keep resting and I will get better eventually, and she gave me a prescription for a viscous lidocaine gargle which is disgusting but does numb my throat (and mouth) for a while. I felt well enough to stop at the store for vodka so I could make my annual batch of cranberry liqueur, which I will write down here so I can quit googling the recipe every year. Cook the water and sugar together into a syrup and cool. Grind the cranberries and vodka up in the blender. Pour everything into a bottle (one of those clear plastic “Simply Fresh” orange juice bottles is just the right size) and let it sit, shaking up the bottle every day, for (optimally) three weeks. I usually can’t wait three weeks, though. Then strain it through a cloth into pretty bottles. My apartment is FILTHY. Argh. At least I’m well enough to care. Jeeze this has been a vicious flu. This is the twelfth day of it and I’m finally starting to feel a bit better (as in, I can sit up in bed and type). I’m going to write down the sequence of events here for my own future reference. This will be a boring post. Come back some other day. Monday the 1st my knees were wobbly, which was odd. I didn’t think much of it at the time but now I realize it was probably a Harbinger of Doom. Tuesday I could tell I was coming down with something. Wednesday the 3rd I woke up with a mild sore throat, a very bad cough, a headache, and feeling generally ill, so I sat on the sofa with Henry (who was recovering from his own bout of the flu) and watched movies all day. Thursday it hit hard. Ferocious sore throat and cough, aches, weakness, chest congestion. I felt too ill to get out of bed, too ill to watch tv, too ill to listen to music. At this point I became unable to sleep because of the endless coughing and the horrific sore throat, so I pretty much sat up and coughed all day and all night for days on end. Friday was much the same. Saturday was the same plus a fever of 99-100.8. I managed to keep drinking because I was scared to get dehydrated, but eating was close to impossible. Managed a couple of yogurts and some toast, I think. Henry brought me water and broth, and checked on me every hour on the scary feverish days. Sunday was awful but the fever was better. Monday was awful and the fever came back. Tuesday, awful but no fever; Wednesday, awful plus fever. Thursday the 11th the fever was gone, throat and cough were microscopically better. I think I was able to watch some netflix that day and listen to music. (That was the ninth day of the illness.) Friday, two days ago, I was able to go out to the living room and sit on the sofa and watch TV with Henry for a while. Throat and cough improving but far from well. Same yesterday. Everything a little better, but still feeling pretty wretched. Slept much better last night. The coughing fits that wake me up are less frequent and less drastic. Throat still hurts but not as much — for a minute this morning it almost didn’t hurt at all. My thoughts feel clearer. Ever since Friday I’ve been able to eat but not much at a time, so I’m trying to remember to eat a little something every hour or two. Over yesterday I ate almost two potatoes and some steamed broccoli and applesauce and yogurt and a pomegranate. I feel like I will actually get better someday; I can imagine it, where I really couldn’t a few days ago. Christmas will be late this year. I’ve done nothing. All our decorations are still in the closet. I haven’t been able to make or plan anything. Oh well. In case you’re wondering — yes, I got a flu shot in October. Ugh I’m so sick. Horrible cough, HORRIBLE sore throat, headache, etc. Came down with it on Tuesday and I’m sure it’ll be weeks until I feel able to record again. 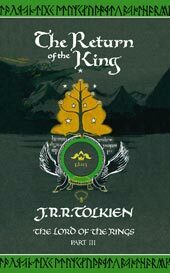 I was hoping that I might be able to achieve my goal of finishing up Return of the King before 2015, but that would have required me to record a chapter every other day through December, and that’s not gonna happen now. Sigh. Return of the King, chapter 8!